I think seedling 178 was the first seedling of the NOID magenta to bloom, though the second to get a blog post. 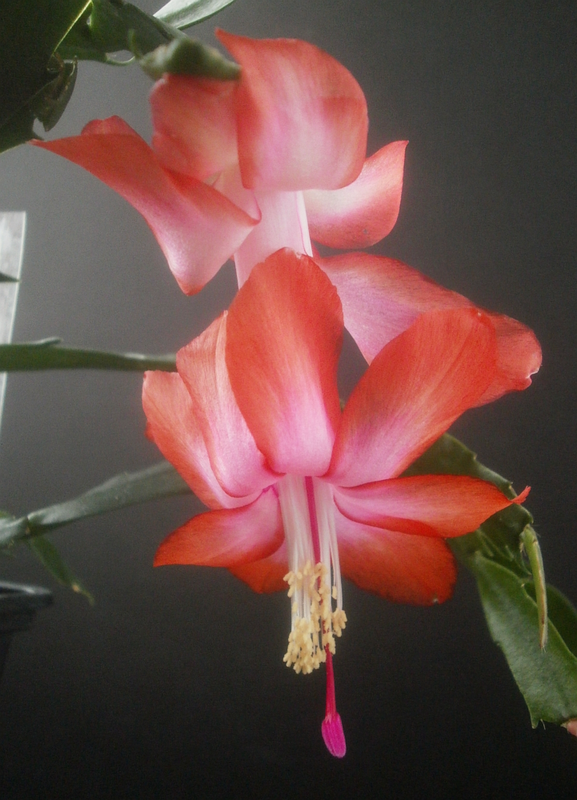 Not that you could tell it's from the NOID magenta by looking at it: it looks like all the 'Caribbean Dancer' x NOID peach offspring that we're all pretty tired of by now. That said, it isn't bad, just treading some pretty well-trod ground. So let's just get to the naming. The four candidates I cam up with this time were: Dusty Springfield, Lulu's Night Off, Saltwater Taffy, and What About The Love. Dusty Springfield is, of course, the singer/producer. Her name was previously considered for seedlings 106A and 033A, but was rejected in favor of Jaws of Elmo and Clueless, respectively.1 Perhaps the third time will be the charm. Lulu's Night Off is one of the suggestions I've taken from my big list of random word combinations.2 I don't know who Lulu is, I don't know where she works or what happened on her night off that would be worth commemorating in a seedling, but I sort of like it that way. Make up your own story of Lulu's night off and leave it in the comments. I don't see much Saltwater Taffy around, though the Menards in Iowa City always seems to have some somewhere. 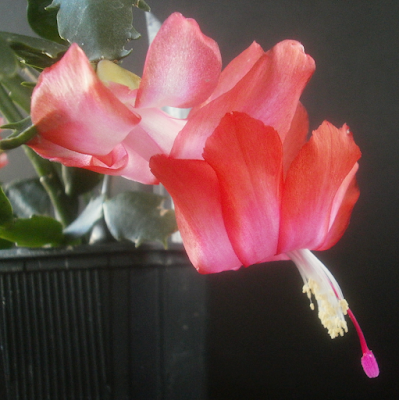 I like it, and the colors often overlap Schlumbergera blooms, which are good enough reasons to consider it for a seedling name. 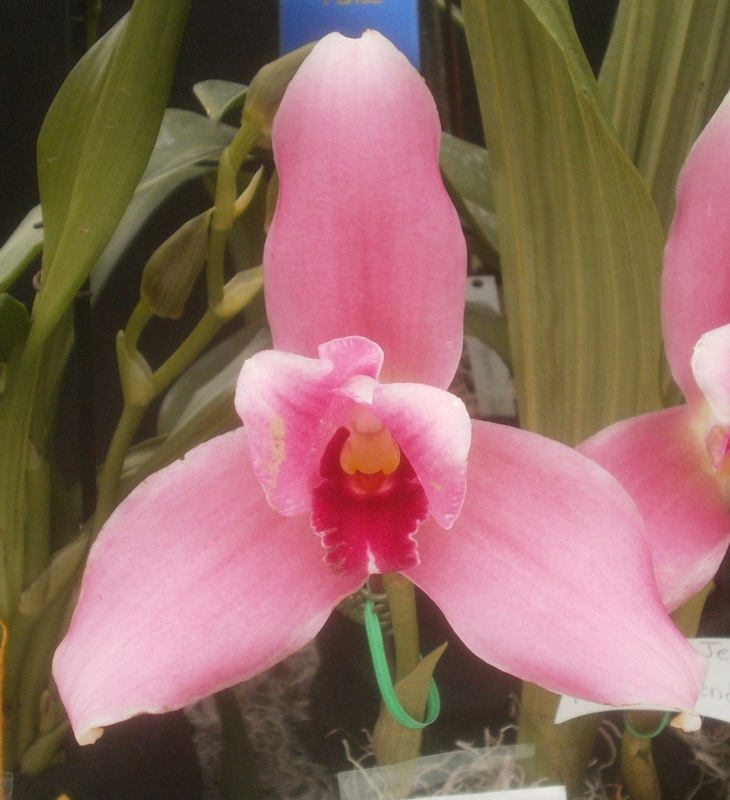 I could see these colors showing up in orange or strawberry taffy. Kind of a depressing reminder, granted, since it also reminds me that that's not really the public face of Christianity anymore. And even in the past, loving one's neighbors was sort of . . . unevenly applied, let's say. But what it was once, in small pockets, it could be again, more universally. In theory. It's enough to hang a hope on. So. I guess What About The Love is a bit too depressing, in that context. Also it's the longest option of the four, which counts slightly against it. So I'll let it go. And although I like Dusty Springfield (more so now that I've just watched a video for "Son of a Preacher Man"), both times this season that I've included a real-life person in the name candidates, I've gone with the person.5 Nothing wrong with that, but it feels a little predictable, and I'm also leaning pretty hard toward people for some of the yet-to-be-decided seedling names. Maybe I'm overthinking this, but I don't want them all to be named after people. So I'm going to drop Dusty for a third time. Sorry, Dusty. So we're left with Lulu's Night Off and Saltwater Taffy. Of the two, I think I like Lulu's Night Off better, specifically because it's both more specific (refers to one particular event) and more open-ended (free to imagine any particular event). Plus having a night off is generally seen as a good, happy thing. Therefore: 178A Lulu's Night Off. 1 Jaws of Elmo was definitely the right decision. I'm less confident about Clueless. 2 Which is where a lot of the names have been coming from this year, though it's not always obvious because it turns out that randomly throwing words together generates the sorts of things people already say and ideas people already have, a surprising amount of the time. Like 020A Feet Of Clay was a random-word idea, and I'm pretty sure 077B Bad Reputation was as well. Jabberwocky Musical (which has, of course, happened already) • Uterus Gun • Expanded Milk (presumably the opposite of condensed milk) • Kitten Chapel • Bottle-Blonde Baby (I bet it's happened) • Moondial (as compared to a sundial) • Clogged Bagpipes (bagpipes do get things in them from time to time, sometimes with fatal consequences, even) • Tiara Repairman • etc. 3 It was written by Janis "At Seventeen" Ian, not Amy Grant, but it was written specifically for Grant to perform, and Grant's version is the one I'm most familiar with, so. 4 Well. I suppose infidel-killing has been a running theme for quite a while. But the others are new. And yes, one could certainly argue that that's not what it means even now, that it's still about feeding the hungry, sheltering the stranger, clothing the naked, caring for the sick, and visiting those in prison, that it's still something that you could call "good news" with a straight face. Yessir, one could definitely argue that. 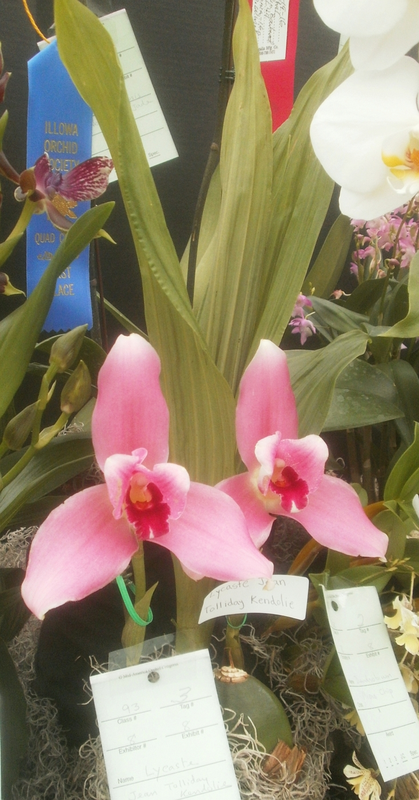 This looks a lot like the year's other Lycaste and Lycamerlycaste specimens. It's possible that I shouldn't have taken so many photos of them. I mean, not that they're not nice and everything. There's just not a lot of variety. a chemical I have strong, pleasant personal feelings about (because I am the sort of person who has feelings about specific chemicals sometimes1). 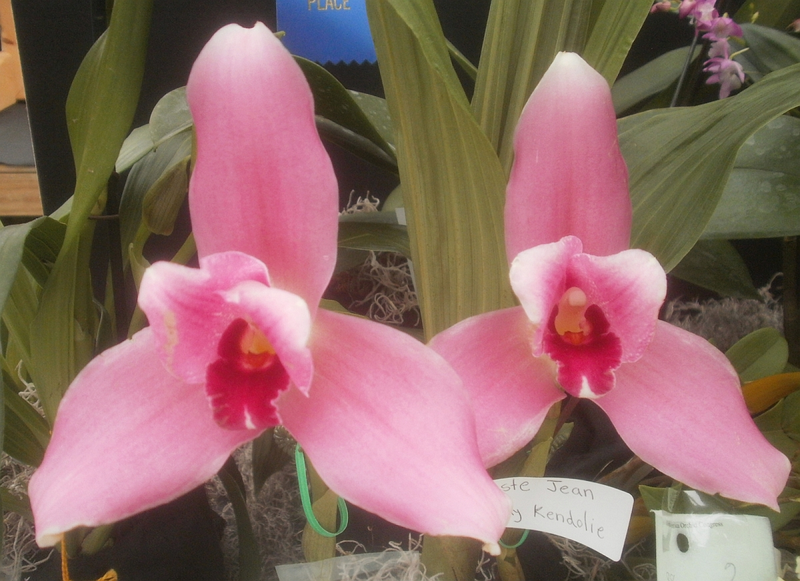 I should note that the plant was tagged as Lycaste at the show, but the International Orchid Registry has one of the parents as a Lycamerlycaste.2 And as goes the IOR, so goes my nation. 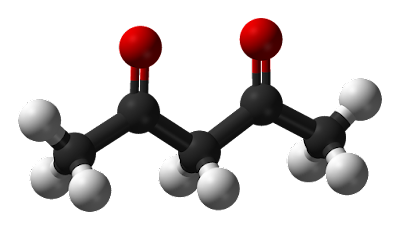 1 Also in the "strong positive feelings" department: benzaldehyde, crown ethers, isopentyl acetate, eugenol, and, weirdly, thalidomide, which I like not for causing birth defects but because the shape of the molecule is strangely and inexplicably pleasing to me. So many molecules, especially pharmaceuticals, have their atoms arranged in an ugly way. 2 Lycamerlycaste is the nothogenus for crosses between Lycaste species and Sudamerlycaste species. 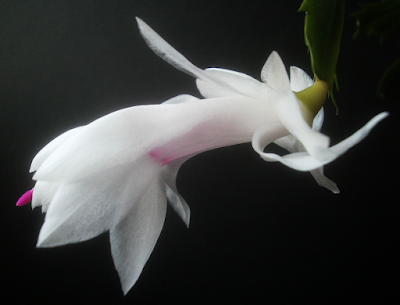 The genus Sudamerlycaste was split off of Lycaste in 2002, says Wikipedia. 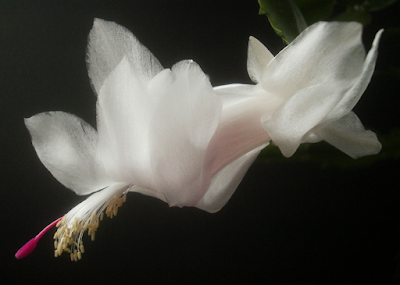 Another white from the NOID white (previously: 283A Migaloo). One thing I've enjoyed about the white seedlings is that there's a substantial set of new name possibilities for them. Three out of the four nominees this time wouldn't make sense for a non-white seedling. They are: I Made It All Up, Ice Castle, Magician's Dove, and There Would Be Peace. I Made It All Up is a reference to the previously-linked piece from the Portal 2 soundtrack. 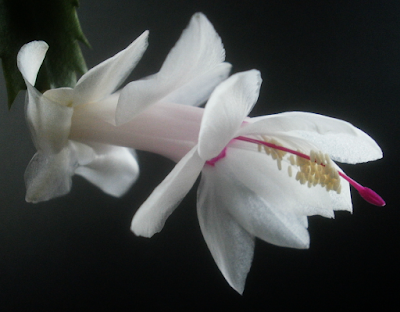 To my mind, it sort of sounds like white Schlumbergera flowers look. The white Schlumbergeras wind up looking semi-transparent against the black background sometimes. This particular seedling's pictures don't show that particularly well, but it's been a problem occasionally for some of the others. Hence Ice Castle, an elaborate white/transparent structure. 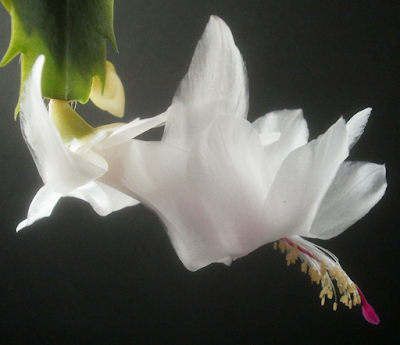 Magician's Dove should be more or less self-explanatory: Schlumbergera flowers usually look a little like birds, because of the way the petals are flung away from the stamens and pistil. And what's a really white bird? Exactly. I'm not clear where There Would Be Peace came from exactly: possibly some association from white to doves to peace, and then backing off of a straightforward "peace" name because it seemed like tempting fate. And I have to say, I kind of like it because it's sort of an unfinished thought. It begs for an if, or but, or except for on the end. It's a pretty strong group; I think I could be happy with any of these names. But I Made It All Up has the least direct connection to the appearance of the seedling -- in theory, anything could be named I Made It All Up -- and I have to drop something, so I'll let this one go. And there's nothing wrong with Ice Castle at all, though when you look at search engine results, ice castles tend to photograph a little blue. Which the seedling is not. 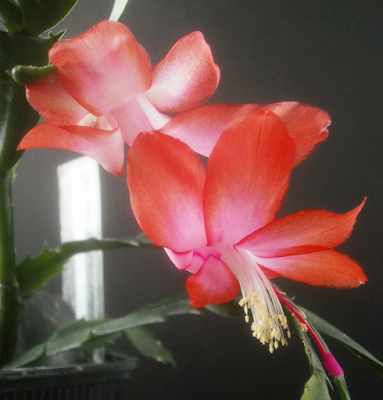 I mean, I'm never going to get a blue Schlumbergera, so I could overlook this, but I have to come up with reasons to throw some names out; this reason's as good as any. Which leaves Magician's Dove or There Would Be Peace, and I'm going to go with the latter on the grounds that it feels more me. Which is to say, I could imagine any number of people tasked with naming a white Schlumbergera eventually landing on Magician's Dove, but it sure feels like I'm the only person who would come up with There Would Be Peace. Perhaps I'm being delusional about my own specialness. Sometimes that happens. But in any case, it's the name I feel drawn to. So: 119A There Would Be Peace.